Crest have spent many years sourcing and vetting various entertainers. This means we can be confident that the artists are exceptionally talented and reliable. 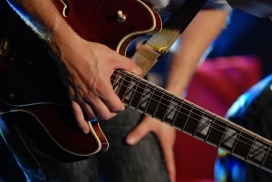 Our event managers can arrange suitable artists to suit your style and tastes. Not only music based we arrange magicians, wine tasting, caricature nights and even comedy acts. See below for examples of the types of artists we can arrange. Finding a DJ that is suitable for your style and tastes, reliable, competitively priced and professional can be a nightmare. Take the hassle out and use our trusted artists. 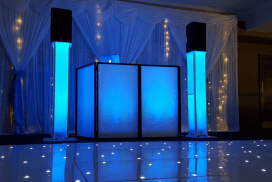 We have spent years sourcing, vetting and building relationships with DJ’s for a wide range of events. Get in touch to discuss your needs. Thinking about hiring a live band or ceilidh band for your event but unsure who you can trust or where to start? Crest Event Management can take that stress away. We only use trusted and reliable live bands and ceilidh bands that we have worked with before. Get in touch to see how we can solve your event entertainment needs. Hire a harpist for a variety of events. Perfect for a wedding reception, champagne reception, party or corporate event. 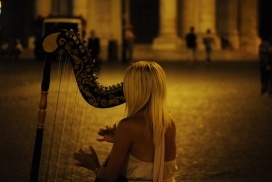 A harpist brings about a touch of sophistication and class to any event. If for a wedding we can source a harpist that has the songs you love most in their repertoire. 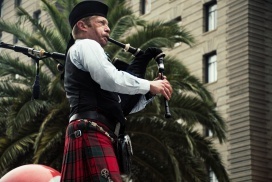 Having a piper play you into your event makes it really special. It announces your arrival and can mark the start of your event like no other instrument.